The winner is Femke Cnossen! The Three Minute Thesis (3MT®) competition celebrates the exciting research conducted by Doctor of Philosophy (PhD) students. Developed by The University of Queensland (UQ), 3MT cultivates students’ academic, presentation, and research communication skills. Since its beginnings at the University of Queensland, 3MT competitions are now held at universities all over the world. 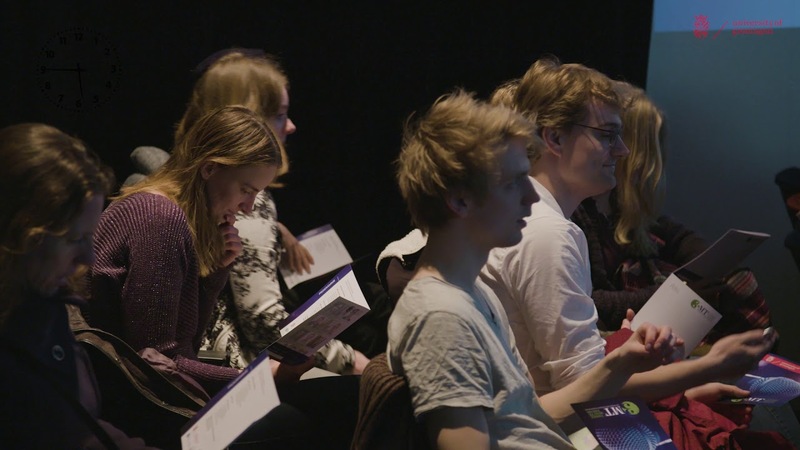 The University of Groningen (UG) will hold its annual 3MT competition on March 13th, 2019 ! Thank you to our participants and everyone who joined the event! Twelve enthusiastic PhD students participated in the 3MT competition (four from each Graduate School cluster Science and Engineering, Medical Sciences, and Social Sciences and Humanities). The participants will train together in workshops given by media training experts to help them prepare for the competition. The experienced trainers were provided by Hakuna Matata and Toastmasters Groningen, and organised by MindMint, the Groningen PhD organisation for research communication. Up to €1,250 travel expenses for an international conference and, if the UG winner will prove to be one of the shortlisted candidates for the Coimbra Group Finals, funded travel and accommodation to represent the University of Groningen at the Coimbra Group Conference in Krakow. Prize winners will be announced at the competition. The decision of the judges is final. Videos of the finalists’ pitches will be posted on the website and the winner will be enrolled in the Coimbra 3MT competition 2019. Dr. Marjan Koopmans, Policy Advisor and Project Manager Groningen Graduate Schools. Hosts: Gopher, MindMint and the Groningen Graduate Schools. After the UG competition, a video of the winning pitch will be sent to the Coimbra Group. From the submitted video's, their Doctoral Studies Working Group will choose the top three entries by April 18th 2019. These three shortlisted candidates will compete at the Coimbra Group Annual Conference in Krakow from June 5th - 7th, 2019 (deadline to submit UG submission is April 18. 2019) . Watch the pitches from our UG 3MT competition 2018! The participants in the Famelab competition hosted by ScienceLinx have also been selected! The Famelab competition will be held on March 28th, 2019. Why not attend both? Last modified: 15 March 2019 3.32 p.m.